Well, first I have to say that I hope my sister doesn't get mad at me for posting this picture. But, I thought it was funny and I love this shot of the 3 of us!! 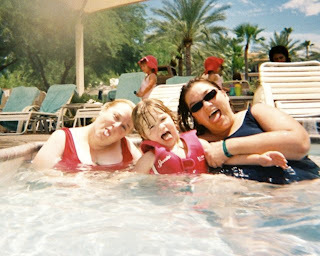 It was from our weekend at the Arizona Grand Resort, and was taken with one of the waterproof cameras I picked up before our visit. We went digital years ago, and I haven't had film developed in I can't remember how long! I didn't want to worry about our digital cameras, though, so I picked up 2 waterproof cameras. When Nate took a picture, Lydia wanted to see the picture right away -- as she is used to with digital cameras. I told her that we'd have to wait, and Nate responded "No, really, how do we see the picture?" He had no concept of film and waiting for processing. By the end of the first day, I saw that one had condensation on the inside of the case. I was disappointed, but hoped that the film wasn't ruined. The Monday after our visit, we dropped off the cameras and even I was shocked to find out that it would be 10 days before we could pick them up! Then, I forgot about them completely until we happened to be in Target and I walked by the photo area. Unfortunately, the one camera did have damaged film, so we only got about 5 shots from that camera. This was one of those shots, though, so I'm glad I had it developed anyway. There were about 5 good pictures from both cameras, but it was worth it to have the memories on film! I love the picture! Looks like you had a really great time! I'm laughing about the film thing, I have abour 8 rolls from 2 years ago that I need to get developed, I just never remember to drop them off anywhere because I'm so used to instant pictures with my digital camera! Glad this shot was rescued from the leaky camera...priceless.